Each way betting is a great source of income for a matched bettor and often it can be one of the most profitable type of offers. At first they may seem confusing, however the more you do them the more accustomed you will be with the process. You might have seen the each way option pop up on a bet slip when you place a bet. The example below is taken from a horse race but you can see them over a variety of sports and events. 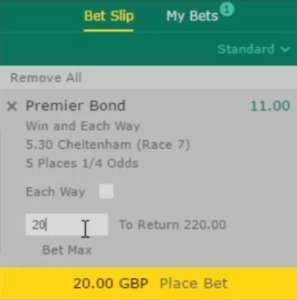 If the each way option is selected you will see (image below) that the bet stake has been doubled in comparison with the first example. This is because an each way bet consists of two bets rolled into one. The first bet is betting on the horse to win and the second bet is on the horse to place. The win part is fairly self-explanatory, you are betting on the horse to win the race. A place bet means that you are betting on a selection to finish in a range of positions. In horse racing this can be places 1-2/1-3/1-4 dependent on the number of horses in the race. When placing an each way bet the win odds are paid out at full odds price whereas the place part is paid out at a fraction of those odds. Generally ⅕ or ¼. Fairly simply it is a way of hedging your bets. You have a feeling a horse or maybe a golfer will do well but aren’t 100% sure that they are going to win, by going each way you cover yourself if they finish within those top positions. In traditional gambling, if the horse wins, then you win both bets, if the horse finishes in the place positions then your place bet wins and your win bet loses. If it fails to finish in the place positions then both of your bets lose. 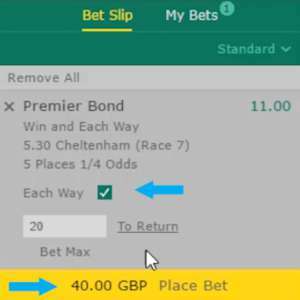 With matched betting, we can neutralise or limit any losses by laying both parts of the bet with an exchange. By laying both the bet to win and the bet to place, you can make sure qualifying losses are kept to a minimum but there is also the opportunity to profit. There are a couple of techniques that can be employed to make profit but the most popular and profitable way is through extra place offers. Extra place offers run frequently and is where a bookmaker will run a special offer to pay out on extra places on a specific race. For example; where a bookmaker would normally pay out on 4 places on extra place races they would pay out on 5. We can take advantage of this because the exchange will not change its own place terms to match a bookies, the place market on the exchange will still be related to positions 1-4 so if our horse finishes 5th we win both our place bet with the bookie and our lay bet in the exchange which can produce very large profits. You can improve your chances of hitting an extra place by increasing the number of horses that you back and lay in a race. Try to avoid to backing more than 2 horses per bookmaker unless it is on a major race like the Grand National. This also has the added benefit for small banks in that it will share your liability within that particular race. With shared liability there can only be one winner of a horse race, and this can be used to your advantage. The amount of money you need to lay a bet is based on your maximum potential loss, therefore if you lay two different results on a market that can only have one outcome, only one of those bets can lose. What this means is that the most you can lose is whichever selection has the largest liability. The liability on the selection with lower liability is ignored for the purposes of calculating how much money you need to lay the bet. To find close each way matches utilise the oddsmatching tools at your disposal with Profit Accumulator. Keep an eye on the extra place close matches thread on the forum or some members find using odds comparison sites useful. By far the easiest way is by using the Profit Accumulator Each Way Catcher tool. Once you have found your bet you will need to work out the lay stakes for both the win part and place part of the bet. 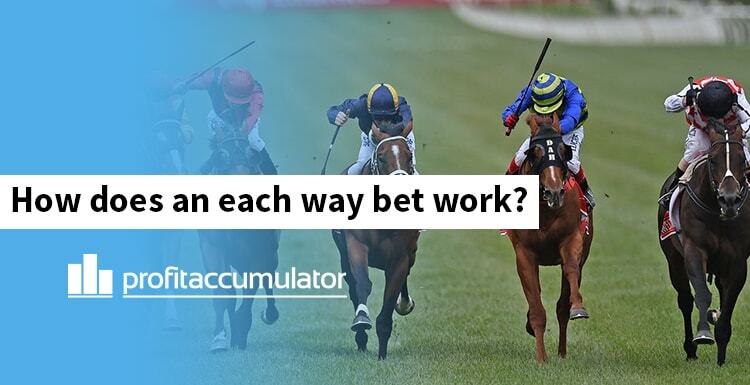 To do this you can use the Each Way Calculator, one of the advanced Profit Accumulator matched betting calculators. 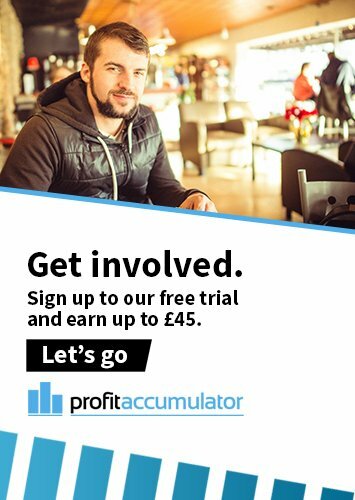 Interested in finding out more and making money from each way bets? Signup to become a Platinum member (the each way tools are only available to Platinum members). If you're unsure about becoming a Platinum member, why not try our free trial. Click here to signup (it's free!). We will walk you through the first two signup offers which will earn up to £45. You have nothing to lose! If you have any questions, please feel free to call or email our customer service team (contact info here). We're open 7-days-a-week.